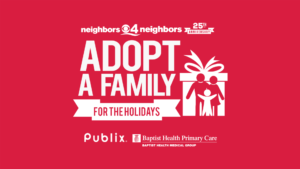 the plan: Neighbors 4 Neighbors, a nationally recognized non-profit dedicated to “connecting those in need with those who can help,” operates an annual Adopt A Family drive to ensure that all South Florida families can celebrate a happy holiday season. theAOinsight Group was contracted to operate a full social media campaign including strategy, content development, graphic design, engagement, and tracking. In addition, we provided a suite of organizational services which included, but were not limited to, liaising with social workers, community agencies, donors, and families by phone and through more than 300 individual emails; recruiting participant social service agencies and training them to use the web interface; as well as troubleshooting and assessing recommendations for improvements to the website and program to improve participants’ experience for years to come. The campaign also included an unexpected challenge – Hurricane Irma and the destruction it caused in our community, necessitating that we recruit and engage with community-based organizations in Monroe County as well as Miami-Dade and Broward to ensure that disaster relief needs were met. #AOinsight staff logged more than 1,000 work hours on this campaign, and the results showed, achieving nearly 30,000 organic social impressions – but, most importantly, resulting in holiday cheer for more than 500 local families in need! resulting in… 29,095 organic social impressions, 1,557 organic engagement, and 505 families adopted! Special thanks to Neighbors 4 Neighbors for bringing inviting us to implement this important community initiative! We invite you to check out our campaign recap report. stay #uptodate and #intheknow. subscribe to our newsletter.